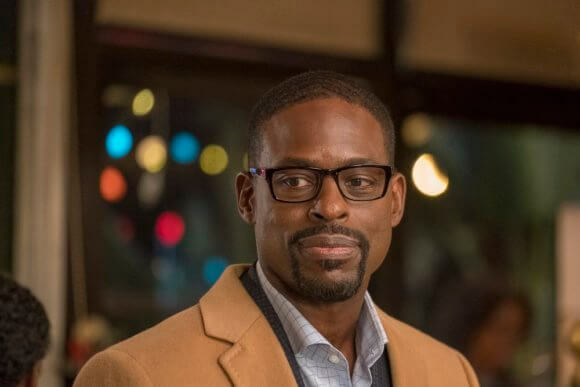 Randall (Sterling K. Brown) was a big winner on election night in season three of NBC’s This Is Us. The city council election might come at a cost to his marriage though. In flash forwards, Randall is alone, and we’ve seen friction between Randall and Beth (Susan Kelechi Watson). For now, Randall is joining Kevin (Justin Hartley) and Kate (Chrissy Metz) in meeting their long lost uncle Nick (Griffin Dunne). Brown was on the set of This Is Us last week when the Television Critics Association visited to see next week’s episode (episode 13 airing February 19th), featuring Beth’s backstory. Brown answered questions about what’s coming up for Randall. This Is Us airs Tuesday nights at 9pm ET/PT on NBC. When you do the flash forwards, do you know everything it entails? Nothing has been what it seems, like Jack’s death and Uncle Nicky. Is it safe to say there are some surprises about what that flash forward means? Will we go back to them this season? Some actors don’t want to know how it ends. Does it influence how you perform every week, knowing how it ends? How does it feel seeing Beth get her own episode? Sterling K Brown: “I love that woman. I’m so excited. I’ve seen this episode. She crushes it. Let me make this official without embarrassing her so she can’t hear me or anything like that. I feel like this is officially, or unofficially, I just want to state Susan Kelechi Watson needs to be nominated for Supporting Actress in a Drama Series. She needs it. Not that she needs it. Like, I need it. I need her to be recognized for the tremendous work that she’s putting in. She’s so dope. To be her husband on screen has been such a joy. It’s so easy. We speak the same language. We went to the same grad school. We have fun with each other and we both recognize it even when it’s difficult. If you’re not having fun, people like to watch people having fun. When you see the actors enjoying themselves, for me as an audience member, I’m like, ‘Oh, these people are having fun. I want to stick around and watch them.’ And I feel like we have that with each other. Did this season feel different given the troubles Beth and Randall have had? Does that continue the rest of this season? People worry with the flash forwards. Randall does the right thing even if it’s at the expense of his family. Where does that come from? Randall was so out of his element running for city council. How out of his element will he be doing the job? Can he fix the community center? Can he achieve his campaign goals? What does Randall think of bringing Nick in? Sterling K Brown: “So I think in this particular instance, it’s about supporting his brother. He sees in his brother’s heart that he kind of yearns for this connection to the past, to knowing his father. To know your father’s brother is to know your father in a way in which you didn’t know him before. So I think he supports Kev in that journey. Were you a jock like Kevin or a geek like Randall as a kid? Sterling K Brown: “Yes. No, I went to a school, a college prep school in St. Louis, Missouri similar to what Randall’s school is and was one of the few raisins in the sun, if you will. Not the only but one of a few. But it was a school where the five black dudes in my class, two of us went to Stanford, one MIT, one Yale, one Harvard. It’s not like we ever said, ‘Yeah, we’re going to crush this,’ but we knew that people would be watching us. I think we just decided amongst ourselves that we’re not going to allow any sort of talks of the reason why you’re here is because of blah blah blah blah blah. No, we’re here because we deserve to be here and we can do the work.